It’s rare that you will ever have a client come into your office stating that they need to find a shelter for next month. When clients request homeless shelters they need answers ON THE SPOT. Because your client doesn’t have time to spare you need to begin contacting shelters immediately. In this guide we’re providing you with emails to at least 23 different Houston Homeless shelters to give you the best chance of linking your client to a safe place to stay. If you have ever tried contacting a shelter for assistance, you know all too well that it typically takes multiple attempts to reach someone. In addition to this, many of the local shelters have a small window for intake. If you client comes to you at 2:35 pm and most of the shelters have intakes that close at 3:00 pm you’ve got your work cut out for you. 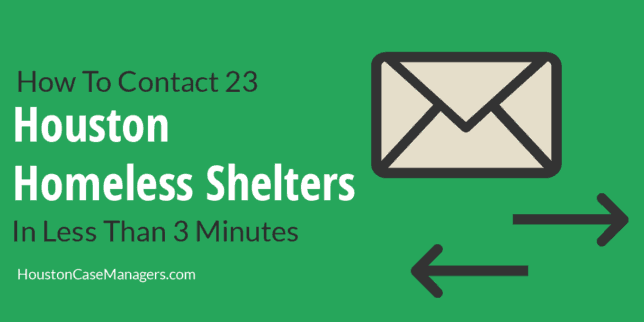 While this is not a fool proof method of connecting your client to a shelter it does allow you to contact multiple shelters with just one email. Note: Even if you send one massive email requesting help, you are still encouraged to call as many shelters as you can over the phone. This guide only provides the email list of each shelter. If you need more information (enrollment process, phone numbers, address, etc) see our Ultimate Guide To Homeless Shelters In Houston article. Below you will find the emails to various Houston homeless shelters. These shelters are separated by the populations that they serve. Some only accept men, others accept only women. There are shelters that take in families and some designated for teens. If your situation is dire enough, contact as many shelters as you can, but a better strategy is only emailing those that your client is likely to be accepted to. The shelters below only accept men. To quickly contact these Houston shelters, simply copy the list below and then paste into the “Send To” field of your email. Do the same for each “copy and paste list” in this guide. The following shelters accept only women. Note: Salvation Army Conroe is the exceptions in this section. They accept both men and women. The shelters below will accept entire families including men, women and their children. The shelters below will only accept women and their children. The shelters below will only accept women who have a history of domestic abuse. Many of these shelters allow women to bring their children. These shelters only accept young adults or teens. The agencies below do not provide shelter, but they can offer supportive services like food, clothing, employment assistance, etc to homeless individuals. If you would like to contact all the shelters in this guide at once, use the master list below. Below is an email template that you can use to contact these shelters. Hi my name is (your name here) and I work with (your employer). I am emailing you today in hopes of (explain the outcome you are wanting regarding your client; connect them to a shelter, find them food, whatever outcome you are seeking type it here). My client,(your client’s name here), is needing assistance because (talk about the circumstances that lead to their situation). I have connected my client with the following services (name the services you’ve connected them with) although I was unable to find (service needed goes here) therefore I am contacting your agency. 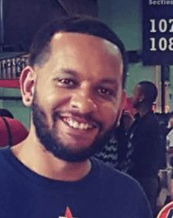 If you are not able to help (client’s name here) with this request, would you at least be able to provide me with guidance regarding my options or another agency who can help. Thank you for your time and any assistance that you can provide. Again this is just a template to get you started. Try and do as much work as you can to get the client connected to the services they need. You do not want the recipient to feel as if you are “dumping” a client on them. You might even end your email explaining the services that you offer and promise to give them special treatment if they ever need the assistance your organization offers. The shelter is helping you out by offering a place to stay for your client, therefore it’s only right that you assist them with any needs that their organization may have. Many Houston homeless shelters have specific intake times therefore it is important to begin contacting them as soon as possible. You will likely get better assistance calling shelters on the phone, however this method of “copy and pasting” emails allows you to touch multiple shelters at once. As aforementioned if you need more information on the shelters above (addresses, phone numbers, specific services offered, intake hours, etc) take a look at our Ultimate Guide To Homeless Shelters In Houston and you will find all of this information.